Thirsty for some great SFF short fiction? Pull up a stool and let me pour you some recommendations. This Round's on me. April showers bring May flowers, or so the saying goes. And this month is certainly the first that feels like spring has finally arrived. For me, though, spring is not about the green of growing things. It's about the snow melting away and revealing all the corpses and downed branches and unfinished projects buried by winter's swift arrival. So while May might be a month of new growth, April is a month very much concerned with taking stock of the landscape and mapping the wounds the winter has left. Which fits wonderfully with the stories on tap this month. These are pieces that reveal histories of pain, abuse, and oppression. That do not flinch away from examining the extent of the damage done, the devastation left over after the storms and the crush of cold. There are genocides and apocalypses and disappearances and murders all to be found in the span of these stories, and yet there's also something else, something that doesn't erase what has happened but creates a space to move forward. Hope. Because though spring is about taking stock, it's also about making plans. And all of these stories don't stop at the tallying of wrongs or the airing of grievances. These stories look to what comes next, and each of them imagine a spring giving way to summer, of pain giving way to the possibility of healing. 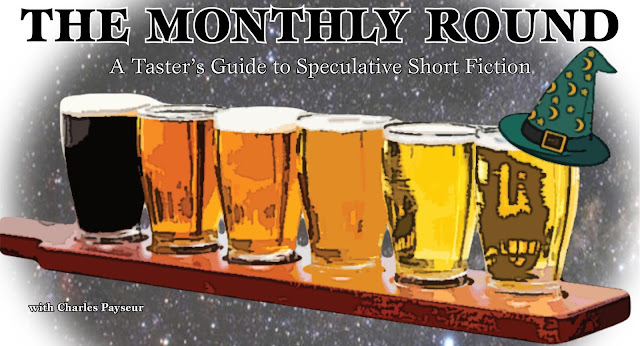 So without further delay, prepare your palates for a delightful tour of April's SFF short fiction. Cheers! Notes: Dense and sweet with a taste of a sun that might not exist, pouring a deep amber that might be mistaken for gold but for the sinking feeling that everything is not what it seems. Review: This is the first of the stories in this month’s Round that introduces a main character with the same name as the author. Here Bougouma is a man at a University, and a man having trouble with his memories. The setting here is startling and yet all too plausible, a world that has been ravaged by overpopulation and scarcity to the point that many people are encouraged to travel below to the Underworld, where there is apparently space and work and yet it’s a place that most people want to avoid. Bougouma’s life is dominated by his school, by classes that seem to repeat year after year and a budding relationship with another student. It’s almost perfect, except that he can never remember what happens to him when he’s supposed to be on break visiting home, and there’s the specter of his younger brother constantly flitting about but never anywhere that Bougouma can find, the two always just missing each other. And what begins as a near future science fiction story slowly morphs into something a bit more horrifying as the reality of the situation begins to bleed through, as Bougouma begins to realize that there’s something wrong, that something is going on that’s not right. Meanwhile the story unfolds from his brother’s point of view, as well, as the momentum of the story acts like a slaughterhouse conveyor belt herding everyone toward destruction, the truth only breaking through the surface briefly, and perhaps too late to help anyone. It’s a cannily crafted and complex story about desire and corruption and harm, where even if you think you’ve escaped the horrors of a broken system you can find yourself still in the thick of it. Notes: Layer upon layer of slightly conflicting flavors give this drink a weight and a darkness tinged with the milky expanse of the galaxy, of stars and distance and the crush of history. Review: This story jumps from perspective to perspective through a series of people involved in the search for an alien world, for an alien people that might hold the key to saving a young man infected with a strange virus. And with each jump in perspective, with each added piece to this beautiful mosaic novelette, the experience deepens. The piece in part a mystery, a question of what has happened not only to the afflicted man whose very genetic code seems to be in the process of rewriting itself, but also to the alien civilization that created it—an alien civilization that isn’t supposed to exist. The story builds with an increasing momentum, meticulously fleshing out this galaxy where humanity is supposed to be the only sentience, but where there is growing and irrefutable evidence that not only is that not the case, but actions have been taken by certain corporations to cover up the truth. The story looks at the weight of colonization and expansion, of seeing the vast galaxy as merely a stage for human exploitation. The characters are all in very different places, many of them engaged in various resistances to the corporations but also most of them defeated and unsure of how to exist apart from the harm that has been done in the name of humanity. They all face a sort of crisis of conscience, to determine what they should do when they uncover the truth and the scope of the tragedy before them. The story is a moving and sweeping portrait of erasure and reclamation. 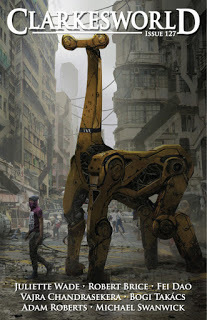 It recognizes the vast damage done in the name of exploration and expansion and exploitation, and seeks to find a way forward, that drags the shadowy work of conquest into the light to hopefully watch it shrivel and die. Notes: Clear and still like the sky after the end of the world, with a bitter, soft taste full of ghosts and memories that can’t seem to stay drowned. Review: This story follows Ebunoluwa, a survivor living in the skeleton of a fallen city, in a world that has been torn apart by conflict and war. Not much remains of the past, just the enormous bodies of colossuses that litter the world and the memory of the creatures they slew, a bloody war that decimated the world and left the survivors scattered. 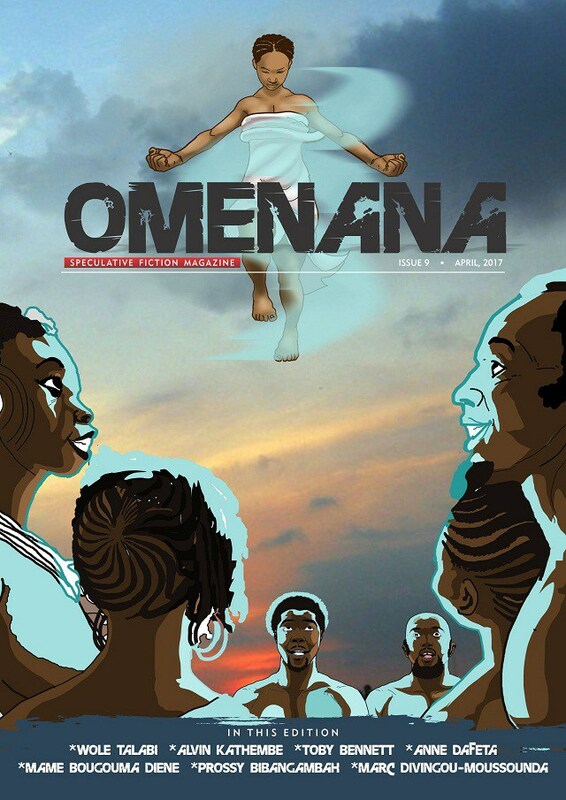 Ebunoluwa lives in both the shadow of that conflict and the shadow of her mother’s contempt at not “overcoming” the end of the world to carry on the family by reproducing, something that might be as much burden as inheritance. Now living alone with just the ghosts of her ancestors and the restless dead of the city to fill the air around her, Ebunoluwa is shocked out of her routine by the arrival of a traveler—one who seems to offer a kind of healing Ebunoluwa forgot she might need. The story is very much about survival and living, about abuse and healing. For the world and Ebunoluwa both, there is no going back to the way things were before the war, before the tragedy that left Ebunoluwa unable to bear children. In the aftermath of the damage done, there is the fear that there is no moving on, that the graves of her parents like the body of the colossus is too present a reminder of what has happened and what has been lost. What remains seems simply to cling to what remains, to the memories of how things were even if there is no hope of going back. And yet with the arrival of this stranger to break the cycle of doubt and fear and abuse, Ebunoluwa is able to remember what it was like when she was young and the world still seemed full of possibilities. She remembers that even though she’s not as spry as she once was, she’s far from dead, and the spark of passion and curiosity and the desire for adventure still burns within her. The story is a beautiful exploration of acknowledging the harm done in the past but letting it rest and moving on so that life and the world can be more than just a graveyard. Notes: Pouring a brazen orange, what could have been a bitter experience is made brighter by the introduction of tendrils of citrus and an aromatic pop that smells like hope. 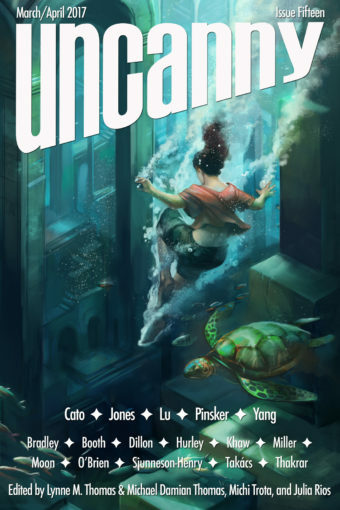 Review: This story does a fantastic job of complicating the “raised animal” trope of science fiction, here with octopuses on an alien world where they have been altered in order to be of greater utility to humanity. Only humanity is gone, their fate uncertain, and the octopuses remain, sharing their memories collectively and communicating much differently than humans. The story for me becomes a lot about responsibility and harm. The octopuses have been altered against their will, have been displaced across space to a world they never chose to live on. They have their own society, their own structure and way of life, and yet they are also curious, driven, and eventually they begin to uncover what has happened to them, especially when they discover a human who was left behind, another victim of humanity and yet part of it as well, and it’s in that discovery that the story finds a lot of its depth, as well as its beauty. I love how the story handles the human-centric world that the octopuses came out of, how imperialism and human supremacy have led to their abandonment on a strange world and yet for humans this seemed a kindness. Like no one would say no to being made more “civilized.” It tackles this very human-centric way of thinking and shows that the octopuses are not lesser for being very different, that though their methods might seem forgeign and inferior because they might not work for humans, for the octopuses themselves it’s the best system. I also like how the story begins to approach reconciliation between the octopuses and the humans, a fragile arrangement that is less than trust, but still leaves room to move forward, to cooperate and try to make something that will work for all people based on respect and consent. Notes: A taste like waking up and a deep and smoky flavor overcomes the seemingly-impenetrable darkness of the pour and leads the taster to a place of joy and sweetness. Review: Revenge is the name of the game when a woman is killed by a local corporation in an effort to silence her labor organizing efforts and brought back by a talking raven to punish those responsible. The story recognizes right away the shape of the expected story, the shape of what we are taught by popular culture and stories justice looks like. Here we have this bird pushing for the traditional response to being murdered and brought back to life—to become a killing machine, a monster. And yet the story captures the voice and the perspective of the main character in this great way, showing how even despite what has happened to her, she can see beyond the individual tragedy of what has happened to the systemic problems at the heart of the violence. She knows that retaliating, that meeting her murder with more murders, doesn’t solve anything, or at the very least doesn’t have anything to do with justice. Because justice is already her vocation, her business. And as a labor organizer she knows that the real villain here is a system that does not value human life. Which I think the story does a great job of examining. So instead of falling for the magic of revenge and instead of giving into the pressure of this bird to find her answer with the report of a gun, the main character works to go further. To dig deeper. To leverage her own murder in order to effect some larger change, to bring down those responsible and continue on the work she was killed for doing. It’s a piece with a great sense of humor and charming voice and it subverts the hell out of the revenge narrative. Notes: Pouring the gold of a sunrise over an infinity of dimensions, the nose is a heady mix of spices and aromas, a multitude of flavors captured in a single drink, with a moving complexity that is a joy to experience and enough alcohol content to have you seeing double...or triple. Review: This story delves into the timeless question of “What if?” More specifically, it imagines a convention made up entirely of iterations of the same person, who also may or may not be the author of the story, Sarah Pinkser. And who wouldn’t want to check out a gathering where every person is a reflection of yourself, a different path you might have traveled but for circumstance? For the “main” Sarah of the story, an insurance investigator, it proves too tempting to pass up, and yet almost immediately upon arrival at the dimensional nexus-point (the hotel holding the convention), she finds herself pulled into a mystery both wholly unprecedented and eerily intimate. It then comes down to this one Sarah, out of everyone attending, to figure out what has happened and determine who is in danger. And the story examines closely what makes a person unique and what blurs together. The idea of the convention is fun and freeing and does a delightful job of showing how these Sarahs differ and how they all draw on certain common events. The story also takes a delicate and complex approach to the idea of choice and determination and justice, with the main character forced to examine the darkness within herself by being confronted by the darkness within other versions of herself. There are also a number of great Easter Eggs and references and the panel names at this convention are just gold. It’s fun to see so many Sarahs all in the same place, and the way that it forms the backbone of the mystery is fascinating and intense. 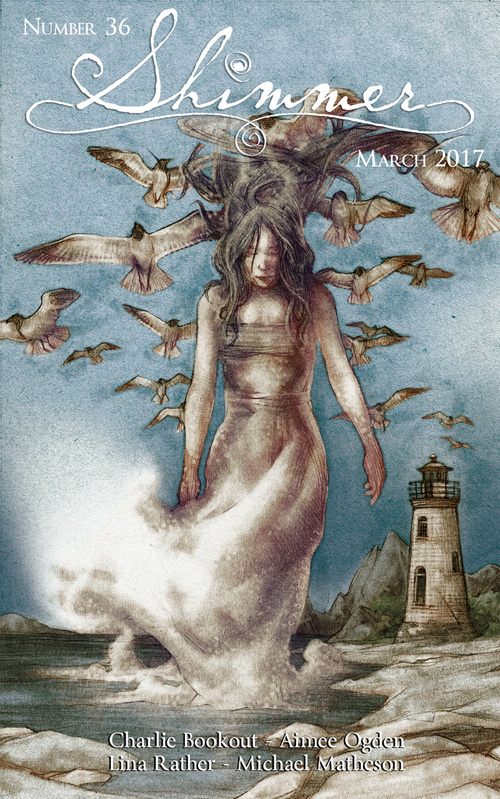 As a novella the story is the longest on the Round this month, but it has no trouble maintaining its pacing or vision. And even with everyone being Sarah Pinsker in the story the cast is still engaging and diverse. It’s a story in some ways about bold steps, the decision of the Sarah within the story to attend this convention no less brave than the decision of the author to write a story completely populated by versions of herself. In both instances, the risk more than pays off, and the result in a brilliant and bizarre story about self, community, and murder.